The period since the Second World war has been an eventful and often disturbing one in the international monetary field. Economic theories have been propounded and modified both to explain these events and to influence future choices made by economic actors. This history of international monetary relations shows both how theoretical development affected private developments, and how the theories themselves have been judged – and often discarded – on the basis of their perceived accordance with actuality. Exchange rate movements in particular are examined in the light of the absence of any generally accepted fundamental model, and the author deploys here his own theory based on the idea of bounded rationality. Finally, he looks ahead to future possibilities for the international monetary system. Includes new sections on: speculators and speculative bubbles; target zones and other proposals for international monetary reform; the importance of free capital mobility and proposals to control capital movements. Money, Banking, and the Business Cycle provides a comprehensive framework for analyzing these mechanisms, and offers a robust prescription for reducing financial instability over the long-term. Volume I bridges tough economic theory with empirical evidence. ‘TheBrussels Commission has just suspended its senior economist, BernardConnolly, for writing a book savaging the prospects for a commoncurrency. There are many who now believe he should be lauded as aprophet.’ Observer, Editorial, 1 October 1995‘Mr.Connolly’s longstanding proposition that the foisting of a commoncurrency upon so many disparate nations would end in ruin is getting amuch wider hearing…‘ New York Times, 17 November 2011When first published in 1995, The Rotten Heart of Europecaused outrage and delight – here was a Brussels insider, a senior EUeconomist, daring to talk openly about the likely pitfalls of Europeanmonetary union.BernardConnolly lost his job at the Commission, but his book was greeted as aprofound and persuasive expose of the would-be ‘monetary masters of theworld.’ His brave act of defiance became headline news – and his book amajor international bestseller.Ina substantial new introduction, Connolly returns to his propheticaccount of the double-talk surrounding the efforts of politicians,bankers and bureaucrats to force Europe into a crippling monetarystraitjacket. Hidden agendas are laid bare, skulduggery exposed andeconomic fallacies are skewered, producing a horrifying conclusion. No one who wants to understand the workings of the EU, past, present and future can afford to miss this enthralling and deeply disturbing book. The finance sector of Western economies is too large and attracts too many of the smartest college graduates. Financialization over the past three decades has created a structure that lacks resilience and supports absurd volumes of trading. The finance sector devotes too little attention to the search for new investment opportunities and the stewardship of existing ones and far too much to secondary-market dealing in existing assets. Regulation has contributed more to the problems than the solutions. Why? What is finance for? John Kay, with wide practical and academic experience in the world of finance, understands the operation of the financial sector better than most. He believes in good banks and effective asset managers, but good banks and effective asset managers are not what he sees. 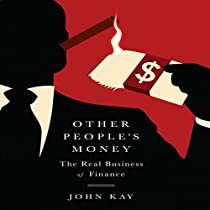 In a dazzling and revelatory tour of the financial world as it has emerged from the wreckage of the 2008 crisis, Kay does not flinch in his criticism: We do need some of the things that Citigroup and Goldman Sachs do, but we do not need Citigroup and Goldman to do them. And many of the things done by Citigroup and Goldman do not need to be done at all. The finance sector needs to be reminded of its primary purpose: to manage other people’s money for the benefit of businesses and households. It is an aberration when some of the finest mathematical and scientific minds are tasked with devising algorithms for the sole purpose of exploiting the weakness of other algorithms for computerized trading in securities. To travel further down that road leads to ruin. Money, Banking, and the Business Cycle provides a comprehensive framework for analyzing these mechanisms, and offers a robust prescription for reducing financial instability over the long-term. The Australian mining company trucks had come roaring into the African village and disgorged over 100 heavily armed Government soldiers. The rebels, protesting at the way the Australian company was mining the Congolese silver and copper without giving anything back to the local community, had already surrendered. But their looting of food and fuel from the Anvil Mining depot at Kilwa could not go unanswered. The Australians flew in the Government troops, loaded them onto their trucks and then stood back while they rounded up the rebellion’s “sympathisers.” “We started running but the soldiers caught and searched our belongings, they arrested my dad and two other boys,” said Albert Kitanika. The soldiers refused to say where they were taking his father. “They took him 50 meters down the road where they shot and stabbed him to death.” A United Nations investigation found Mr Kitanika was one of at least 100 people summarily executed in the Government operation in 2004. Afterwards, the Australian company issued a press release praising the Government for its rapid response. Asked about its role in transporting the troops, Anvil’s chief executive officer Bill Turner said: “So what.” Mining is a dirty business. This book reveals that the real dirt lies in the boardrooms of some of Australia’s biggest companies. The United Nations named Katumba Mwanke, an adviser to Congo President Joseph Kabila, as one of the people responsible for the illegal exploitation of Congo’s natural wealth. Anvil Mining put Mr Mwanke on the board of directors for three years. The Australian company has steadfastly refused to sign the Extractive Industries Transparency Initiative, designed to prevent dodgy deals, and is instead considering a tie-up with British mining company Trafigura, which is responsible for one of the worst pollution scandals in recent history. When details of deaths arising from Trafigura’s illegal dumping of tonnes of sulphur-contaminated toxic waste were raised, Trafigura attempted to stifle reports in the British Parliament with a super-injunction. Anvil Mining is just one of many Australian mining companies whose dubious operating methods have been called into question both at home and overseas. At home mining is impacting on the lives of every Australian. In Esperance in Western Australia a doctor called for the lead levels in children to be checked after 4000 birds died in a few months. Lead from WA mines was suspected. In Kalgoorlie Newmont mining admitted dumping 7000 tonnes of poisonous mercury over the city in just 12 months. It causes chronic brain and kidney damage. In Tasmania 30 km of the Arthur River has been killed by the run-off from the Mt Bischoff tin mine. In Queensland illegal mining pollution is damaging the Barrier Reef while in Darwin a uranium mine sits in the middle of Kakadu National Park—both World Heritage sites. These are issues that affect Australians today. Pollution from mining is entering water courses and the drinking supply of every one of us. The toxic effects are deadly. Overseas, Australians like to boast of their green credentials but it is our mining companies who are representing a very different side of Australia to the world. Companies like CSPB, part of Wesfarmers which owns supermarket chain Coles, which buys phosphate from Western Sahara. Exiles from the region claim Australian money is being used to support an oppressive regime and maintain an illegal Moroccan occupation. Or the Australian owned Esmerelda Mine in Romania, which was responsible for a massive cyanide spill that spread pollution across three countries. Despite this Australian Mining companies oppose legislation that would apply the same standards to their work offshore as they have at home. Amid all the complicated economic theories about the causes and solutions to poverty, one idea is so basic it seems radical: just give money to the poor.Despite its skeptics, researchers have found again and again that cash transfers given to significant portions of the population transform the lives of recipients. Countries from Mexico to South Africa to Indonesia are giving money directly to the poor and discovering that they use it wisely – to send their children to school, to start a business and to feed their families. Directly challenging an aid industry that thrives on complexity and mystification, with highly paid consultants designing ever more complicated projects, Just Give Money to the Poor offers the elegant southern alternative – bypass governments and NGOs and let the poor decide how to use their money.Stressing that cash transfers are not charity or a safety net, the authors draw an outline of effective practices that work precisely because they are regular, guaranteed and fair. This book, the first to report on this quiet revolution in an accessible way, is essential reading for policymakers, students of international development and anyone yearning for an alternative to traditional poverty-alleviation methods.